For the first time ever, Pennsylvania and New Jersey are poised to create a regional network of bicycle and pedestrian trails. In an unprecedented collaboration, six different counties and agencies in eastern Pennsylvania and southern New Jersey submitted a joint proposal to build 17 different trail segments to the U.S. Department of Transportation. On September 15th, the City of Philadelphia, Delaware, Montgomery, Schuylkill, Camden counties and the Pennsylvania Department of Conservation and Natural Resources applied for $36 million of U.S. DOT Transportation Investment Generating Economic Recovery (TIGER) Discretionary grant funds to add 16.3 miles of trails and bridge crossings to the “spines” of the region’s network: The Schuylkill River Trail and the East Coast Greenway along the Delaware River. The proposal, called Generating Recovery by Enhancing Active Transportation in Pennsylvania and New Jersey (GREAT-PA/NJ), would significantly complete an integrated, multi-county bicycle pedestrian network for the region. By filling in 17 critical gaps along the Schuylkill River Trail and the East Coast Greenway, it would help connect over 128 miles of bicycle trails in the region, providing more active transportation options and more multi-modal connections for the region’s 6 million residents. 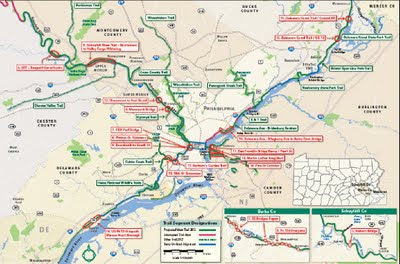 “We are thrilled that after years of planning and public outreach but little construction, this grant program offers the Greater Philadelphia region an opportunity to finally build new trails so it can transform itself into a more connected, economically competitive and sustainable community,” said Spencer Finch, Director of Sustainable Communities at the Pennsylvania Environmental Council. The public benefits of filling out this network include the creation of 1,400 jobs, the connection of residential neighborhoods to commercial corridors and places of work, the connection of residents to transit stops, economic development, enhancement of underserved neighborhoods access to green space and alternative modes of transportation, and improvements in public health. It will enhance the sustainability of the region by increasing the number of those who are able to (and enjoy!) walking and biking instead of driving for short trips, thus reducing greenhouse gases and air pollution. “If this application wins approval, the region will finally have what it needs to entice more people to switch from their car to more sustainable modes of transportation for short trips: a connected trail network that can be used by users of all ages and backgrounds throughout the region to commute, run errands, exercise or go to a nearby park,” said Sarah Clark Stuart, Campaign Director at the Bicycle Coalition of Greater Philadelphia. The submitted proposal includes trail segments and bridge crossings in Schuylkill (1 segment), Montgomery (3 segments), Philadelphia (7), Delaware (1), Bucks (2) and Camden (3) counties. The sponsors of the projects include: Schuylkill River Heritage Association, Montgomery County Planning Commission, Philadelphia Department of Parks and Recreation, Schuylkill River Development Corporation, Bartram’s Garden, Delaware River City Corporation, Pennsylvania Environmental Council, Borough of Marcus Hook, Pennsylvania Department of Conservation and Natural Resources and the Cooper’s Ferry Development Association. The proposal also received letters of support from over 52 elected officials, institutions and non-profit organizations, including all four Senators and eight Members of Congress in the region. The proposal submission coincides time-wise with Philadelphia’s celebration of a new bicycle facility the Mayor’s inaugural ride of the new Spruce and Pine Street bike lanes on September 23rd. This sounds like an interesting project. Do you know if the proposal is available somewhere online? too bad there isn't any mention for construction of the Cresheim Valley Trail. A feasability study has already been and is likely to get jurisdictional approval from relavant authorities. Lost opportunity. I wish that map called out the bicycle trail through Merchantville in Camden County - already in place and waiting for a connection through Camden to Philadelphia, and out to Moorestown via Maple Shade. We are ready and raring to go here.